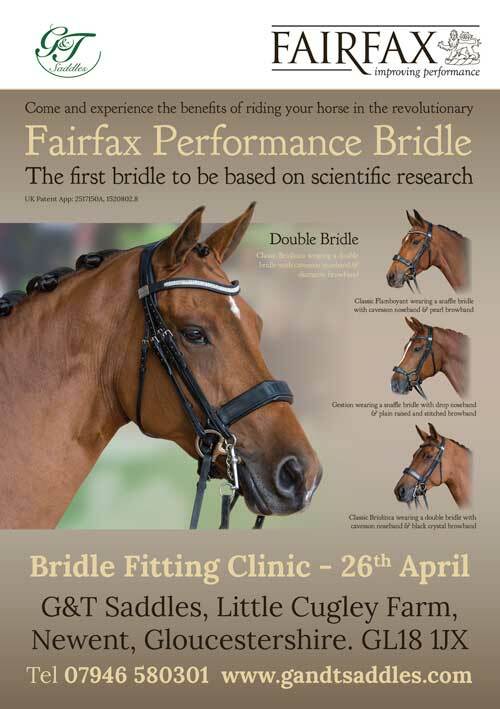 An opportunity to ride in the Fairfax Bridle with Di Fisher who will be on hand to fit and use rein gauge technology. Approx 45 minute session, £30 per horse. £30 not payable if Fairfax Bridle is purchased! Lovely light indoor arena with refreshments available throughout the day. See Fairfax website for further info on the bridle www.fairfaxsaddles.com for further information on the bridle. As G&T Saddles we have been a strong mother & daughter team for the last 4 years, based near Ross-on-Wye in Herefordshire, covering extensively this area and the surrounding counties. We have worked incredibly closely and been so unquestioningly supportive of one another - despite occasional differing of opinions! I will forever be indebted to my mother for all she has taught me; Terri is a truly exceptional horsewoman and subsequently given me a foundation and a career. Consequently it has been a major decision to move to East Yorkshire where my partner Michael is based, but with this comes great opportunity. Covered in quality hide leather, double stitched with a non-stretch webbing core. Designed for a rider wanting an ultimate close contact feel, featuring a forward cut flap with supportive knee block. The tree is close contact and narrow through the twist. The mono flap design reduces bulk under the leg enabling the rider to feel closer to the horse. Made from the best quality calf leather with padded detail. Alex had an undoubtedly difficult start to the year owing to Alfie undergoing Kissing Spine surgery. The result however has been resoundingly positive and Alfie has come back stronger as anticipated. During the challenging weeks that followed, Alex’s patient and careful nature was reflected in his steady rehabilitation of Alfie. Alex had 3 sound Novice runs with strong cross country rounds. The highlight being achieving a 9th place at Dauntsey, flying round a technical cross country showing their natural combined strength! The climax of the season came for Alex competing in his first International event at Hartpury in the CC1*. When exhibiting with the tradestand some months earlier, we were told a story of Alex in his early teens (from a non-horsey background) being dropped off for lengthy days at Hartpury International on foot with a back pack, camera and great deal of enthusiasm and ambition to one day ride there himself… what a fabulous dream to have made into a reality reflecting the tenacity of this young man! Alex and Alfie produced a good dressage and were well inside the time on a long cross country course, with one unfortunate pole down show jumping. However the showjumping caused far greater problems for other combinations, so reflected the significant improvements Alex has made in this discipline. Alex picked up 2 BE points and 1 FEI point for finishing in the top 50% of the field; a jolly strong performance for his first International! Moving up to Intermediate Alex had a convincing run at Gatcombe in the rain. It was a phenomenally strong field, dominated throughout by professional riders which can be an intimidating experience in itself. The dressage had some fabulous work but sadly a couple of less consistent moments affecting the mark. Despite this Alex showed his flair on a challenging cross country course which Alfie simply flew round! Once again, one illustrious pole showjumping, however many others incurred greater faults than Alex and Alfie in this phase. Pontispool and Broadway saw two less fortunate runs but Alex is fully aware that working through these moments is as crucial as experiencing the overwhelming highs. I can accept partial responsibility for the little runout at a technical fence in the water at Broadway, for telling others that day what a ‘strong combination they are cross country; Alfie is just a machine and loves it!’. 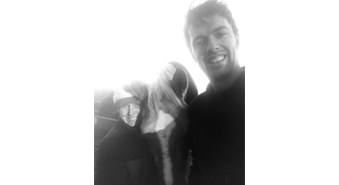 The season finished on a high at Aldon in their first CIC**. Despite a sea of mud in the dressage Alex produced a pleasing test with complimentary marks from an FEI judge. A big showjumping track saw just the one pole down once again. The pair then returned to standard form flying convincingly round the toughest cross country challenge to date. Over the winter months G&T Saddles will look to providing support with flatwork training to consolidate this phase. Alex now has a fabulous 2* horse whom he has produced himself, bring on 2018! G&T Saddles are incredibly proud to offer continued sponsorship to working dressage rider Meg Daley. Meg has previously competed internationally with success at Young Rider level. Now, with her own Ceaser whom Meg has produced herself from Elementary, training with Carl Hester and Islay Auty, Meg has donned her tailcoat once again as they approach Small Tour level! One of the highlights of 2017 (and for us as G&T too!) was heading to Bolesworth International to watch Meg take part in the BYRDS Young Professional Quadrille. Bolesworth Castle is one of the most fabulous settings and particularly in the glorious sunshine it was a pleasure to witness. The Quadrille also performed at Hickstead CDIO 5* and the British Dressage National Championships at Stoneleigh. Meg will continue to be a valued and consistent member of the Quadrille Team into 2018. Meg and Ceasar enjoyed success at the Petplan Area Festivals qualifying for the second round at Prix St George and since have stepped up to Inter I. On only their second outing, the pair produced an incredibly smooth and consistent test to qualify for the final of the Small Tour Championships to be held in December. Meg is now enjoying consolidating Ceasar’s training at Inter II! For 2018 Meg is aiming to campaign Ceasar at Small Tour level at Premier Leagues and attain qualification for the Music Championships… we greatly look forward to supporting you and the very best of luck!